This hadnt been an ordinary love, though. Not a love between two dear friends, or even high school sweethearts. This had been the most taboo sort of love there was: a relationship between a student and her teacher. Isabel started her high school career as a normal student, but set her sights on Tom Stevens as soon as she met him, and pursued him with an intense and sometimes reckless fascination. When he finally approached her after swim practice and told her that he shared her feelings, it was the start of a forbidden and dangerous relationship. We meet Isabel, a determined 15 year old sure of what she wants, and in Sweetest Taboo she wants Mr Stevens. A crush that leads her on to discover that he feels the same way. I'll be honest, I haven't read many books like this, the only other book I've read that includes a student-teacher relationship is Jacqueline Wilson's 'Love Lessons', and you can't really compare that with Sweetest Taboo. 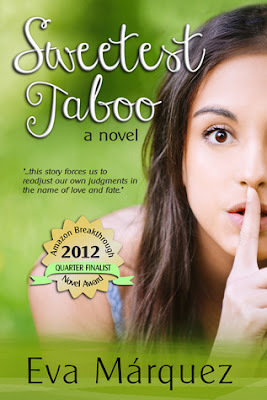 Sweetest Taboo is mature, and definitely not for younger readers. This book was different to the type of books I usually read, but I'm glad I did, thanks to Eva for sending me it! I enjoyed reading this book, and even though I struggled at times with Isabel and Tom's relationship-he is married with kids, I read to the end wanting to know how their relationship would continue, what would happen next and seeing if they would get caught. And yeh he is married, and yeh he has kids. I would be lying if I said I was instantly won over with their instant connection, cos I wasn't, but as you read the book, you get the feeling that they do really love each other. But ok, maybe that doesn't justify the lying and the cheating, Eva Márquez presented their love as something real. I loved the characters created, especially Liz! She was funny, encouraging and really supportive. A friend anyone would be lucky to have. Though at times I didn't always agree with what she was saying to Isabel, I could tell she wanted Isabel to be happy. A quick read exploring a controversial topic, interesting and thought-provoking. You'll want to read till the end.